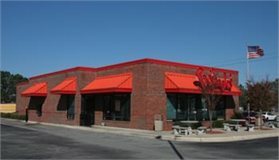 Greenville, NC Bojangles'® Tands, INC. Store #21 - Bojangles'® / Tands, Inc.
Want a meal that’s delicious, filling and fast? Bojangles’® in Greenville, NC is famous for our Cajun chicken, biscuits made daily from scratch, and our Legendary Iced Tea®. We’re always committed to quality, friendly service and will make sure your Bojangles’® experience is a good one. For breakfast, lunch and dinner, Bojangles’® is a favorite for Greenville, NC residents. Located on the corner of Fire Tower Rd and Arlington Blvd, this Greenville Bojangles’® offers the perfect gathering spot for shoppers to get together. We are also a convenient spot for a quick meal for business professionals. Bojangles’® catering service in Greenville is perfect for an office breakfast or lunch!